How can I seperate the bones? I'm somewhat sorry if the answers to my questions seem obvious, but I've searched for, and couldn't find, a way to seperate the bones. I extruded them and now they are ONE object. I can't move them or change the position individually. I think you're probably still in object mode if you're having that problem. In object mode, press tab to change into edit mode so that you can modify the base/default position of the rig in relationship to the mesh you are trying to modify. If you want to separate a child bone from it's parent bone, say the forearm bone from the bicep bone, press y while that bone is selected. This will keep the bones as part of the same armature, but remove parenting inside the armature. To split them into separate armatures press P.
You should keep them all as one object, however, since they are all interacting with one mesh. What you are probably trying to do is simply enter pose or edit mode. To go into pose mode press ctrl + tab. To go into edit mode press tab. Not the answer you're looking for? Browse other questions tagged bones or ask your own question. How do you parent Armature Bones and In what order? 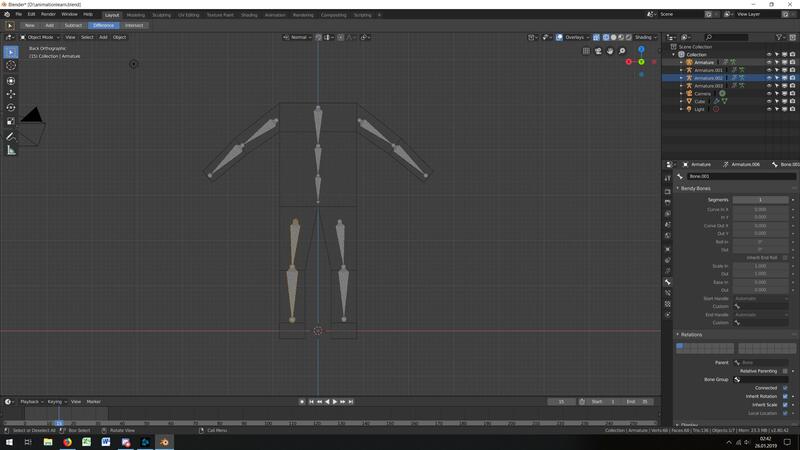 How can I link bones from the same armature? Head to Tail and Vice-versa? How do bone (skeleton) layers work?